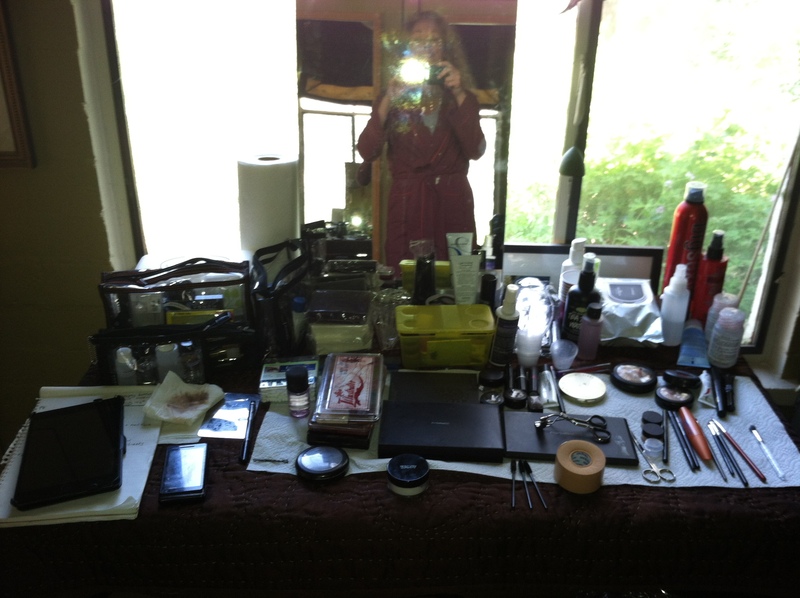 My makeup artist’s station. I’ll spend a good bit of time here! And…they’re off!! Day one of principle photography of “Scream at the Devil” was a gem. We got some amazing footage, and I finally got to sink my teeth into an amazing role. I love emotional work, but I have to be honest, I never really cared for the melodrama of the soap work. It was just too prefabricated for my taste, not to knock anyone else’s guilty vice! I know many people love the genre and with good reason, it’s a blast to get involved in the long running stories, but as an actress, it was my least favorite medium. One of the things about film work that I love is the fact that you shoot out of order, it sort of isolates the scenes so that I can focus on that moment, but this may be the most challenging version of that I’ve ever taken on. Now imagine this; I’m playing a schizophrenic with multiple ‘episodes’ of dementia. So, sometimes I’m lucid, but often I’m not, it runs like increasing waves. Add into that that we shoot per location and supporting actors who are scheduled in. In other words, all my scenes in the kitchen with Eric Etebari will be shot in one day, all my scenes without him—another. There are kitchen scenes throughout the movie. Tony Todd, who plays the compassionate police detective, is only working one day, so we shoot all his scenes on Tuesday, beginning, middle, and the final shot of the movie. Just keeping track of what wardrobe I’m in is a challenge. (Thankfully not mine, that’s the wardrobe department and the script supervisor’s job.) Then I add in my emotional roller coaster ride, estimating which loop-de-loop I’m jumping on and off on. At last I have a point of reference to work off for the rest of the filming. I know my level here, therefore, I can gauge my level there. A couple of my favorite moments: I was standing near the kitchen counter in wardrobe, barefoot, and I accidentally knocked a glass off the counter, it smashed all around me. The gaffer, (lighting director) shouted, “Don’t move” So I stood, frozen on one leg, as he crossed to me, wrapped his arms around my thighs and lifted me. He moved me to safety and set me down, like I was a light stand. It was hysterical. The FX designer, was watching the video playback of an effect we created where my spine expands, this is the guy who has worked on every movie from Jurassic Park to Men in Black, to…well, you name it, and he actually shuddered a little and said, “That was really creepy.” So funny. I love those little things. It made me laugh, and it’s so fantastic to work with a crew filled with enthusiasm and talent. My husband is truly remarkable in the way he inspires and complements everyone, it’s why he brought so many people up through his theatre that have gone on to great things, but still love theater arts. The crew is watching him work, realizing they can trust him beyond their own vision, they are watching the monitor and muttering that it already looks like a 5 million dollar movie. Sure, people get tense, the testosterone runs high, I have to remind the first assistant director, (whose job it is to run the set) that I’m working here and they need to settle down and stop shouting at everyone to hurry right before I have an on screen melt-down. But ultimately, we are all working for a common goal, what a wonderful feeling. And it’s so cool what you can do with more creativity and energy. So, a short blog today, as I have a script to study and an insane week coming up, but here’s my note for today. Do it. Be creative, learn your craft, be ready, positive, and always, always be a part of the solution, not the problem. Stop shouting, don’t blame, fix, listen, look for ways to help, not just in the job assigned to you, respect everyone else, and enjoy it. Put your hands in the air, raise your eyes, and shout at the sky, just for the joy of it. Previous postWhen it Rains…I Love It! Next postSleep and Other Luxuries.